What is a Dynamic Image? Dynamic Images or Wallpapers are new to macOS Mojave. 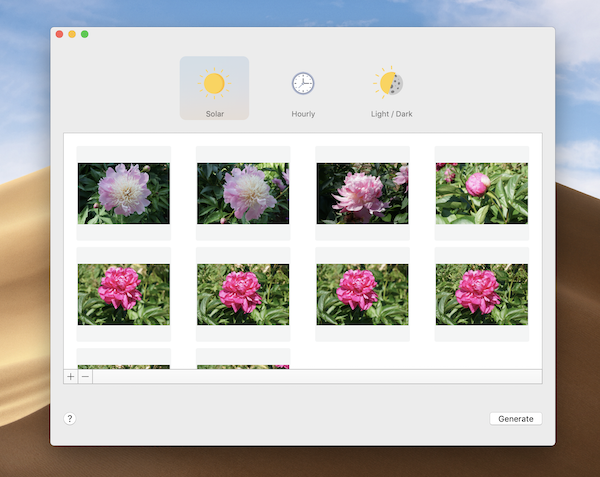 Created using two or more images, a dynamic wallpaper can change throughout the day based on time, location, or the appearance settings of your Mac. For more information on the different types of dynamic wallpapers, see Types of Dynamic Images. What types of Dynamic Wallpapers can I create? 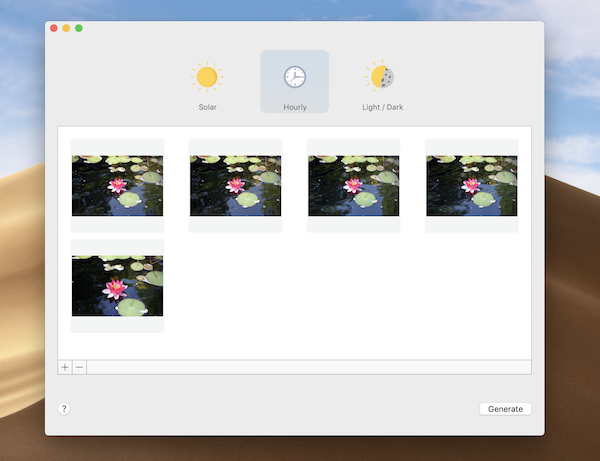 There are three types of dynamic wallpapers we can generate for macOS Mojave. A wallpaper that changes throughout the day based on the position of the sun relative to you. For more info see Creating a Solar Image. A wallpaper that changes at a set time interval throughout the day. Hourly images can update once, twice, or even twenty four times a day, depending on how many images you supply. For more info see Creating an Hourly Image. This type of wallpaperour mac has only two states that correspond with the current theme setting of your Mac. 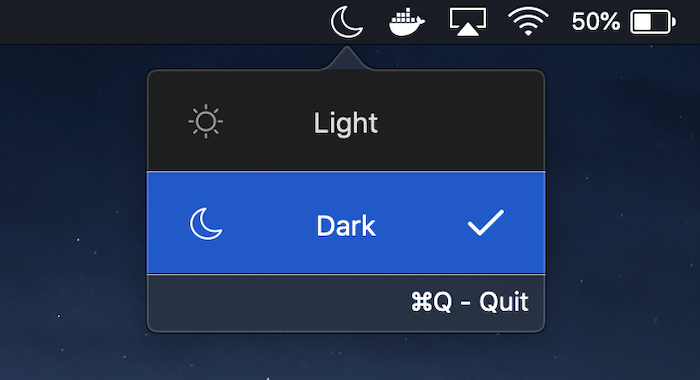 One image for dark mode and one for light. For more info see Creating an Appearance Image. How do I create a Light/Dark Dynamic Wallpaper? To create a Light/Dark based dynamic wallpaper, start by selecting the Light/Dark (far right) tab in the main interface of the Dynamic app. This should display a view with two image drop areas, as seen below. As this type of wallpaper consists of only two images, a light image and a dark image, the main interface for this mode consists of two image drop areas. The left-most being labeled 'Light' and the right-most labeled 'Dark'. Add content to either drop area by either dragging your images onto the main window or by selecting the + button in the bottom left of the corresponding drop area. Any image added the the left/light area will be added as the background to be used when your Mac is on the Light Theme. 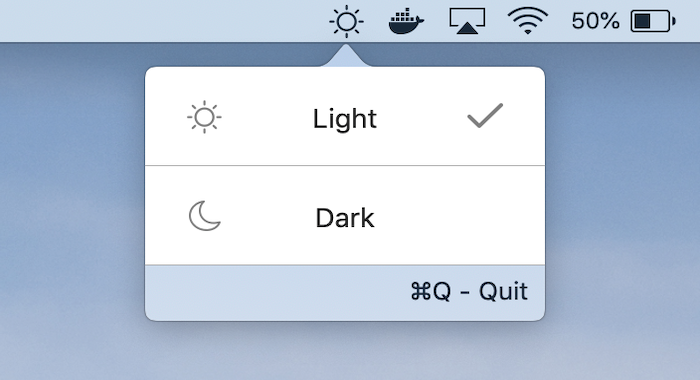 Alternatively, any image added to the right/dark area will be used only when your Mac is running on the Dark Theme. How do I change themes on my Mac? Or try out this handy menu application to make changing themes easy. What is a Hourly Wallpaper? An Hourly wallpaper changes images at set intervals throughout the day. 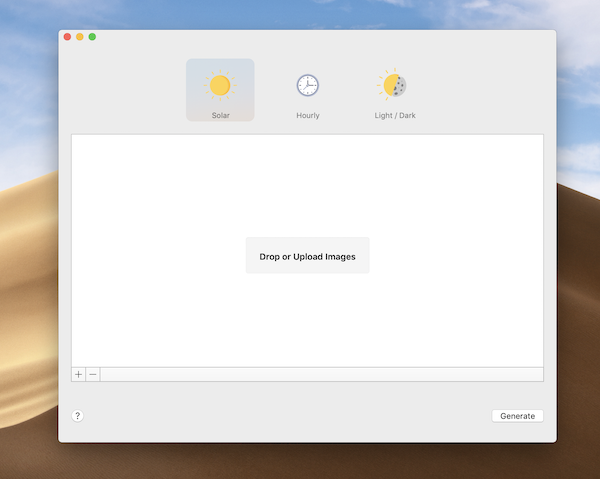 Images will transition automatically based of the time specified by your Mac. Hourly wallpapers can consist of up to 24 unique images and therefore can change up to once every hour. How do I create a Hourly Dynamic Wallpaper? To create your own hourly based wallpaper, start by selecting the Hourly tab from the main interface. You should see an image drop area as pictured below. Add content to the drop by either dragging your images onto the main window or by selecting the + button in the bottom left of the drop area. Images will be added to the wallpaper in the same order they appear withing the main window. The images you add to your wallpaper will automatically transition throughout the day, depending on how many images are added. The duration of each image will be 24 hours divided by the total number of images in the wallpaper. For example, if a wallpaper contains 6 images, each one will last 4 hours. What is a Solar Wallpaper? Solar wallpapers transition through a series of images thgoughout the day based on the sun's location relative to you, similar to how the default wallpaper on macOS Mohave behaves. How do I create a Solar Dynamic Wallpaper? Creating a solar based dynamic wallpaper is quite similar to the creation of an hourly based wallpaper. Start by selecting the Solar (far left) tab from the main interface of the Dynamic App, as shown below. The images you add to your wallpaper will automatically transition throughout the day based on the relative movement of the sun.